For every ‘yup’ there’s a ‘but.’ This year’s Best Picture race is an unlikely field. Some major stat looks to be broken since all the contenders have a bit of baggage that decreases the odds of a confident win. Get ready for the Oscars to break the Internet on Sunday night! 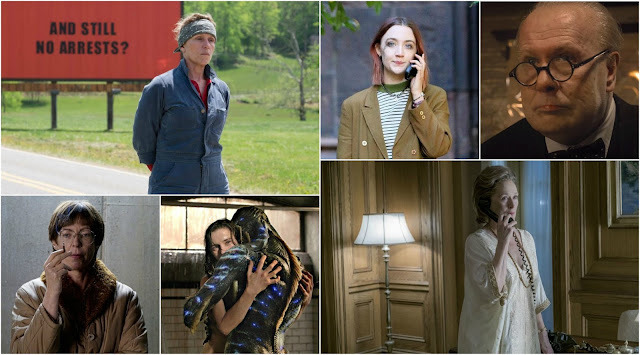 Awards season ends its six-month grind of toxic mudslinging on March 4th when either Three Billboards outside Ebbing, Missouri or The Shape of Water takes Best Picture. It’s a tight race with Get Out, Dunkirk, and Lady Bird having adoring fans, and after last year’s crazy finale, the memory of #OscarsSoWhite, the shadow of Harvey Weinstein, the stench of Donald Trump, and the energy of #TimesUp, it feels as if there are many factors percolating with the usual stats and precursors. With an open mind, let’s look at who will win and should win in the top categories! My attitude, however, is that we had to press the reset button once the preferential ballot and flexible 5-10 nominations came into play with the 2011 Oscars. You also can’t compare contemporary awards season against what won in 1932. I think Billboards has this one because the film is widely praised for its sharp writing and brilliant acting. Director Martin McDonagh was not nominated, but unlike Ben Affleck, he wasn’t winning Best Director even the film when was winning the top prize at events like the Golden Globes, SAG Awards and BAFTAs. The director prizes are all going to del Toro for The Shape of Water and, since the preferential ballot began, there’s been an uptick in Best Picture/Best Director splits with the showier, more visual effects driven productions taking the director prize with the less showy films nabbing the top gong. (See: Spotlight and The Revenant, Argo and Life of Pi, 12 Years a Slave and Gravity.) Add to this the surprise People’s Choice Award win for Billboards at TIFF over The Shape of Water, which was widely tipped as the favourite, along with the recent appearances of real billboards mimicking the film’s call-out to authority, and there is no denying that McDonagh’s dark comedy taps into an anxiety within the cultural consciousness unlike the other nominees. Don’t believe the Internet backlash. That’s just noise. The Post doesn’t have a chance with only two nominations. But, heck, the last Best Picture to win only two Oscars was newsroom pic Spotlight. Go, Meryl! 1) The Post 2) Dunkirk 3) The Shape of Water 4) Three Billboards 5) Call Me By Your Name 6) Lady Bird 7) Darkest Hour 8) Get Out 9) Phantom Thread. For the reasons listed above, I think Guillermo del Toro will win for his richly layered and cinematically intoxicating fairy tale. I’m personally rooting for dark horse Christopher Nolan, who displayed astonishing technical and artistic mastery with the most ambitious and challenging production of the five. Jordan Peele and Greta Gerwig made terrific films and while I think both Get Out and Lady Bird are strongest for their writing, the directors will certainly be back in this category in years to come. The acting categories seem pretty much locked. The four frontrunners—Oldman, McDormand, Rockwell and Janney—collectively swept the major awards and will add Oscars to their Golden Globes, SAGs, Critics Choice Awards, and BAFTAs. Darkest Hour is Gary Oldman and he deserves to win for his transformative showstopper of a performance that disappears underneath gobs of make-up. He’s long overdue, and criminally underappreciated given that this is only his second nomination. Those factors make for stiff hurdles for his only real competitor, Timothée Chalamet, who could have won this any other year for his subtle and devastatingly bittersweet work in Call Me By Your Name. We all know how this is going down. Frances McDormand’s savagely funny work in Billboards is leading the film to win Best Picture. If she loses, then maybe it’s to Sally Hawkins who could tip Shape to win with her magical and musical performance as a mute cleaner who fucks a fish. Any of these performances, like Chalamet, could have won any other year though. Saoirse Ronan? So funny and natural in Lady Bird! Margot Robbie? So brilliant and brave in I, Tonya – so good in fact, that in the history of her 21 nominations, this would only be the second time that I wouldn’t vote for the great Meryl Streep. Which says a lot about Robbie’s work, since Katherine Graham is easily top tier Streep. Dafoe was the bigger critical favourite, but Rockwell walloped him in the awards that count. While Rockwell’s character has been the source of the most ire against Billboards—namely, criticism that his hotheaded racist cop is redeemed in the end—the backlash isn’t really fair. Dixon isn’t redeemed at the end. He simply realizes that he needs to change, and don’t we all need to believe that is possible? Rarely have I sat through a festival with the experience of seeing a performance explode as an Oscar favourite. That performance was Allison Janney in I, Tonya. Everyone went in to see a contender in Margot Robbie, and while she delivered, the buzz from the world premiere and after was for Janney. She is acerbically funny as the monstrous mother of Tonya Harding, but there’s a subtle pain to her performance that elevates it. Just look at the jealous and resentment with which she views her own daughter. LaVona hates Tonya for getting the attention her mother her, which feeds their family’s cycle of anger and violence. Some critics say Laurie Metcalf will win here, but I think the show of support for Metcalf in the critics’ prizes phase, while warranted, was more advocacy than anything else. Manville’s been gaining critical support for her brilliantly restrained work in Phantom Thread, which a lot of critics couldn’t see in early stages, and might be taking some votes away from Metcalf. Octavia Spencer is great, but this performance demands repeat viewing to appreciate, while Blige’s nomination is her award. There’s no beating Janney. She’s a respected character actress who has worked in a ton of movies (The Hours, American Beauty, The Help, Juno) and her effort on the campaign trail has been widely applauded to boot. 6.0! Marshall - "Stand Up for Something"
«Will win: "This is Me"
«I’d vote for: "This is Me"
What do you think will win? Which Oscar contenders are you rooting for?